Ian Orr, the multi award winning Chef Patron of Browns Bonds Hill Group, will feature on BBC Saturday Kitchen Live on St Patrick’s Day, Saturday 17 March at 10.00am. 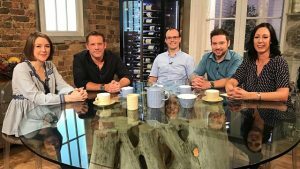 Starring alongside presenter Matt Tebbutt, Ian, whose restaurant was awarded Best Food Tourism Experience in Northern Ireland for 2017, will be cooking an Irish themed dish to tempt the taste buds of this week’s celebrity guest, Amanda Redman. Ian Orr opened Browns Bonds Hill with Marcus Roulston in 2009. The restaurant has twice been named Best Restaurant in Ulster by Restaurants Association of Ireland and has won the coveted title of Best Restaurant in Derry~Londonderry from Restaurants Association of Ireland for nine consecutive years. It is across the Foyle from its sister restaurant Browns in Town which has been awarded for customer service excellence by Restaurants Association of Ireland. Their portfolio includes Ardtara Country House Hotel in Upperlands, which has been awarded for customer service excellence by Restaurants Association of Ireland and named AA Guest Accommodation of the Year in NI 2017 and Browns On The Green and Barnhill Bar & Grill in Letterkenny. They also offer bespoke outside catering with Browns Anywhere. Browns Bonds Hill has been named in Sunday Times Ireland 2017 Top 100 Irish Restaurants and in Business Post Top 101 Great Irish Restaurants 2017. Ian Orr appearing live on BBC Saturday Kitchen Live, BBC One, Saturday 17 March at 10.00am.